It’s not that One Chance is a bad movie, but it suffers from predictable biopic clichés, a conventional, riskless storyline, and an all-around TV movie kind of feel. This is the story of Paul Potts, a Welshman who faced considerable challenges in his life in the path of pursuing his dream of becoming an opera singer, which eventually led to him winning the inaugural edition of Britain’s Got Talent in 2007. The acting is alright and David Frankel’s direction is sufficient, but by the time this 103 minute movie draws to a close, there’s not much more on display here than a standard by-the-numbers production that’s quickly forgettable. Paul, played by James Corden, was born and raised in Port Talbot, Wales. From an early age, he had been active in his church choir and an avid opera enthusiast, which often resulted in constant bullying from the other kids of his town. His mother Yvonne (Julie Walters) was always more supportive of his singing than his father Roland (Colm Meaney), a straightforward and brash working class man. Skip forward two decades, and not much has changed. Paul is now in his thirties, an employee of the cell phone shop Carphone Warehouse, and still marginalized by many members of the community. After winning the grand prize at a local talent show, Paul is able to pay the entry fee to attend a music school in Venice, with the ultimate hope of being able to perform before Pavarotti himself at a recital. From here, Paul’s life begins to go off on a bit of another direction, with opportunities to use his talent in ways that he never quite anticipated. Of course, we have anticipated them. We know from minute one where the story is going, and the only factor of revelation is the exact order that is taken to achieve them. Unfortunately, the main issue at hand with One Chance is that this may be the sole part of the film that generates any interest. It’s not particularly entertaining or interesting, able to hold your attention consistently but not in a way that requires much thought or consideration. It feels utterly safe, and yet there’s something about its charisma at a whole that works hard to forgive most of the sins on display – the fact that somewhere, deep, deep inside, there’s a pleasant, fresh, and all around better movie swirling around, telling you that it’s there, even if it may not be able to show itself. 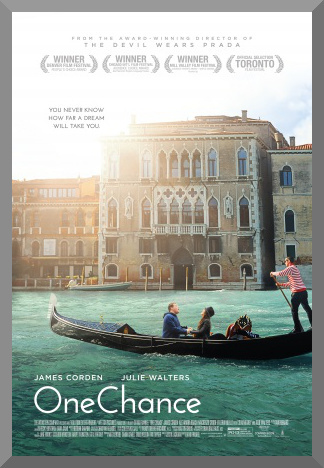 Corden plays Potts with a likable efficiency, a textbook performance in the school of underdog protagonists, perhaps, but he places his own spin on it, working well within the limits of an otherwise unassuming movie, as does the rest of the cast. Alexandra Roach is particularly good as Julie-Ann (a.k.a. Julz), Paul’s girlfriend, whom he meets after talking with her online for months. Despite some rocky times in their relationship, Julz is paramount in much of the launching of Paul’s career. Julie Walters and Colm Meaney are also solid as Paul’s parents, but this isn’t surprising. Factoring in quibbles like a run time that could have been cut short by about ten minutes and a finale that, in an attempt to blend real footage and reenactments, inadvertently creates one of the most awkwardly edited scenes I’ve seen in ages, threatening to derail the sequence’s natural emotional momentum, One Chance is a deeply imperfect movie. It’s far from being a disaster, saved from such a fate by the quality of its performances and the general degree of fascination that can be drummed up from the story of Paul Potts. While I left One Chance more informed about this man than the little information I knew going in, this can’t single-handedly be used as a qualifier of success. This is ultimately little more than a mildly dizzying show of sap and over-sentimentality at its worst moments, deeply offsetting the emotional effectiveness and crowd-pleasing charm that can be observed at its best.